US Sec. of State hints his upcoming visit will mean more pressure on Israel, makes no mention of rampant Palestinian incitement. 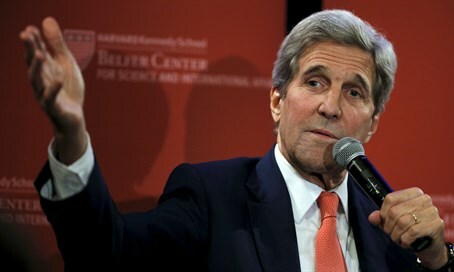 US Secretary of State John Kerry is planning a trip to the Middle East to meet both Israeli and Palestinian Authority leaders, in what he is touting as an effort to end the current wave of deadly Arab terrorism sweeping the country. "So here’s the deal. What’s happening is that unless we get going, a two-state solution could conceivably be stolen from everybody. And there’s been a massive increase in settlements over the course of the last years. "Now you have this violence because there’s a frustration that is growing, and a frustration among Israelis who don’t see any movement. So I look at that and I say if that did explode – and I pray and hope it won’t and I think there are options to prevent that – but we would inevitably be – at some point we’re going to have to be engaged in working through those kinds of difficulties. So better to try to find the ways to deal with it before that happens than later." Kerry added that the Obama administration would be using its last year or so in government to push for a solution to the conflict - in what could foreshadow yet another push for massive Israeli concessions. "We have another 16 months in this Administration, and I can assure you we’re going to stay engaged and continue to try to work through these issues, because there are options and there’s a better other side of the current conflict that we’re witnessing," he said. In a speech to the Knesset on Monday, Israeli Prime Minister Binyamin Netanyahu rejected the notion that the current wave of Arab terrorism had anything to do with a lack of progress in talks with the PA, instead blaming extremists committed to Israel's destruction for encouraging the violence to achieve precisely that. "The terrorism does not stem from frustration over the lack of progress in the diplomatic process," Netanyahu said. "The motive of the terror is to destroy us. That was the objective of terrorism from the first days of Zionism, and that is its objective in our days as well."